Conservatories and windowsills are good sites for growing vegetables. Put heavy containers on the floor or a firm support. Some vegetable plants, including trailing species, are suitable for growing in hanging baskets fitted with integral drip trays. Mushrooms are straightforward if you have space in a dark cupboard. Some plants such as chicory and rhubarb can be forced to produce their crop earlier than normal. Tomatoes, peppers and eggplant: These easily raised tender crops are favorites for a sunny windowsill and can be grown from seed or small plantlets. For window boxes or hanging baskets, choose pendent varieties such as Tumbler tomatoes. Train cordon varieties such as Sweet Million tomatoes up canes or string in a conservatory, where they will produce long trusses of tasty, decorative tomatoes for several months. Peppers and aubergines are less prolific. Carrots and radishes: Most root crops need greater depth than you can provide indoors, but radishes, especially round or globe varieties that do not root very deeply, grow well in boxes, troughs and pans. Seeds can be sown from late winter until mid-autumn, often producing usable roots 21 to 25 days later. Round carrot varieties are also successful in pots and boxes. 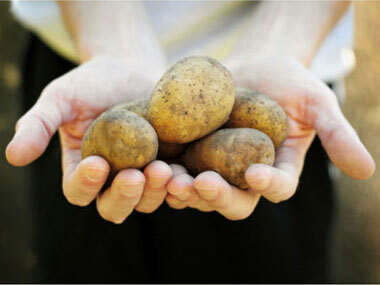 Potatoes: Seed tubers used for outdoor plantings are easily grown in large pots, buckets or even plastic sacks, and produce worthwhile yields of tasty new potatoes. When planting the tubers, leave space at the top of the container for adding more compost to earth up the plants as they develop. The top of the sack can be rolled down to start with, then rolled up, as required. Mushrooms: Mushrooms are an ideal indoor crop for any time of year. Prepared bags of special compost with mushroom spawn only need watering before being left in a draft-free, dark place such as an attic or cupboard. Keep at 50 to 60ºF (10 to 15ºC) and mushrooms should be cropping a few weeks later. Alternatively make your own compost with straw and a purchased activator. Pack this mixture in a sterile container, such as a large plastic bucket. When the initial heat has died down and the mixture is turning into compost, add the spawn. Beans and peas: Dwarf french beans can be sown in pots from late winter onwards for early pods. Dwarf broad beans and dwarf runner beans crop well indoors, too. Tall runner beans grown on cane wigwams or on string up the side of a sunny conservatory are decorative as well as productive, and both dwarf and tall mangetout peas will do well as houseplants. Pick the pods while they are young, tender and juicy.